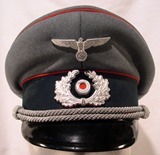 Peaked cap (Schirmutze) for army artillery officer of private production. Inside, in fact, there is the manufacturer's mark on celluloid rectangle: "E. Breuninger A.G.-Stuttgart". The red color piping means the army specialities: "artillery". The peaked cap, high quality already in origin, is in perfect condition except for a small hole on the top piping of the right side. Notify me of updates to Artillery officer's visor cap.